Recently I came across a fantastic eBook on Data Driven Learning Design by Lori -Niles-Hofmann [twitter] that you should really have a read of if you do any form of Learning and Development. Whilst reading the eBook, the first thing that struck me was that I’d not heard of Digital Body Language, and it just made perfect sense to me and I had to know more. Today’s learners are accessing digital content hundreds, if not thousands, of times a day, resulting in extremely fickle attention spans. 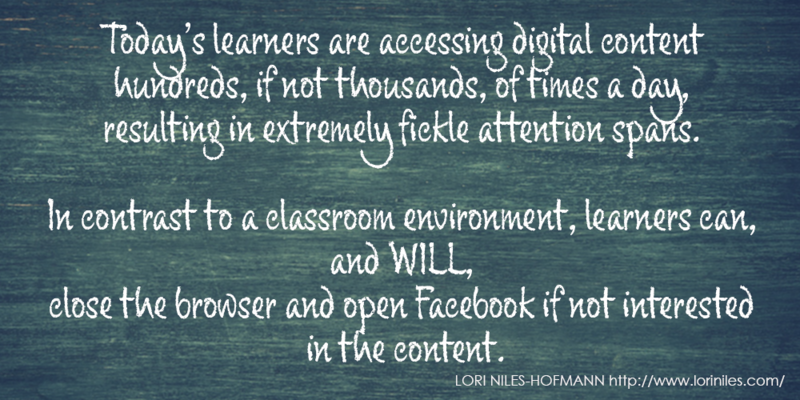 In contrast to a classroom environment, learners can, and WILL, close the browser and open Facebook if not interested in the content. Seriously, go and download the eBook, grab a coffee and have a read, you might be surprised!